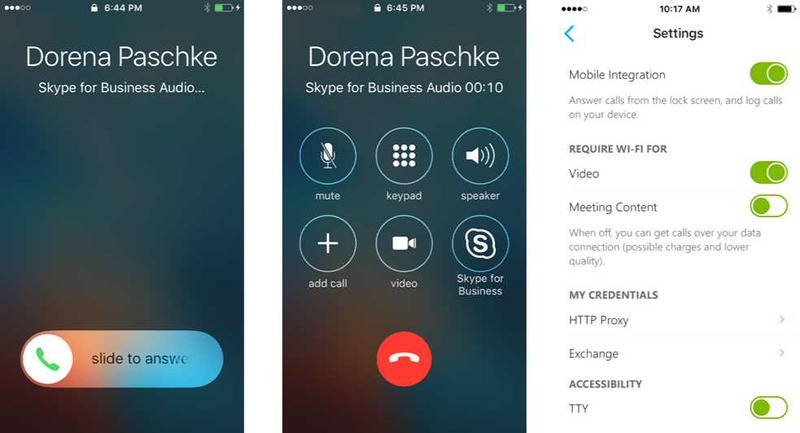 Microsoft today posted more details about integration of Skype for Business with iOS CallKit. Now Skype for Business calls works the same way as the native calling experience on Apple iOS. You can now switch between calls across Skype for Business, your personal cellular line and other VoIP applications supporting CallKit. Answer Skype for Business calls from lock screen: Now, iPhone users can accept an incoming Skype call right from the lock screen. There is no need to unlock the phone or launch the Skype for Business app to receive the call. Skype calls will appear and behave just as regular cellular calls do. When you need to, you can also get to the app from the calling interface with just one touch. Handle Skype Business calls like any other call: This integration also allows you to switch between calls across Skype for Business, your personal cellular line and other VoIP applications supporting CallKit. If you are in an important Skype for Business conversation and receive an incoming cellular call, you can send the second call to voicemail or put the Skype Business call on hold to accept the incoming cellular call. You’ll also see Skype Business calls in your phone’s call history. Built-in IT and user controls: These new features are enabled by default for all iOS app users. In scenarios where you may not want the Skype Business calls to appear in the native iOS call log, the built-in IT and end-user controls allow you to disable the CallKit integration altogether. IT admins can disable this integration for their users through a policy, and app users can also control it in the settings.